Welcome to the Queen City Road Runners Flyball Club. We are a small flyball club located half way between Clarksville and Dickson, Tn. 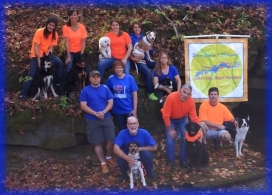 Our indoor and outdoor canine activities facilities are located on Indian Creek Road, a mile and a half from Tn Hwy 48. We practice weekly and our practices are open to the public. We ask that anyone wishing to visit, contact us in advance. We travel to weekend events, and would hate to miss you. Check out the Classes page and the Practices page for current schedules. We are a flyball club because we enjoy the challenges involved in team canine sports. Flyball is not the only activity we do with our dogs. Some of our members attend AKC conformation shows, obedience, Rally, and lure coursing meets. Some of our members also participate in agility and herding. For the Queen City Road Runners, flyball is an exciting, challenging, and rewarding dog sport.